Downtown Fremont Street pizzeria is a mini-shrine to legendary daredevil Evel Knievel. : Evel Pie is a downtown pizzeria operated in cooperation with Evel Knievel’s son Kelly. 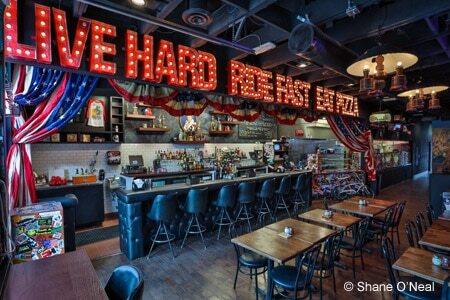 Décor is a mini-shrine to the legendary daredevil with nearly every inch of the walls covered with Knievel memorabilia, and a hand-painted mural of Snake River Canyon, a bronze statue of Evel and an illuminated marquee sign bearing the restaurant’s motto: “Live Hard, Ride Fast, Eat Pizza.” The NY-style pizza can be customized with 18 different toppings or guests can choose from the specialty menu, featuring pies such as the “world famous Snake River special” with rattlesnake jalapeño sausage, onions, bell peppers and fresh garlic. Pizzas are paired with a selection of American beers including several local brews like Crafthaus Saison, Joseph James Weize Guy and Tenaya Creek Bonanza Brown.